Be fashion forward with the cheri rolling business tote. 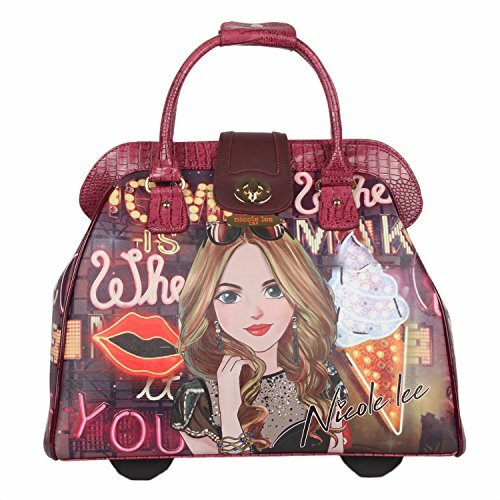 Exterior features: design printed on faux leather, faux leather handles and trim, front buckle embellishment, top zipper closure, back pocket compartment for retractable handle, back wheels for easy rolling and Nicole Lee nameplate in front. Interior features: large storage space, zip wall pocket with metal Nicole Lee nameplate in front compartment, padded laptop compartment fits up to 14" notebook. With velcro strap and NL logo nylon lining. Dual top handles with 5 inch drop. Retractable handle extends up to 25 inches from the body. Eco leather exterior. NL exclusive print all around. Twist lock and monogrammed zipper pull. Back pocket compartment for retractable handle. Dual top handles with 5 inch drop. Retractable handle extends up to 25 inches from the body. Interior features: large storage space, zip wall pocket with metal Nicole Lee nameplate in front compartment, padded laptop compartment fits up to 14" notebook. With velcro strap and giraffe print with nl logo satin lining. If you have any questions about this product by Nicole Lee, contact us by completing and submitting the form below. If you are looking for a specif part number, please include it with your message.